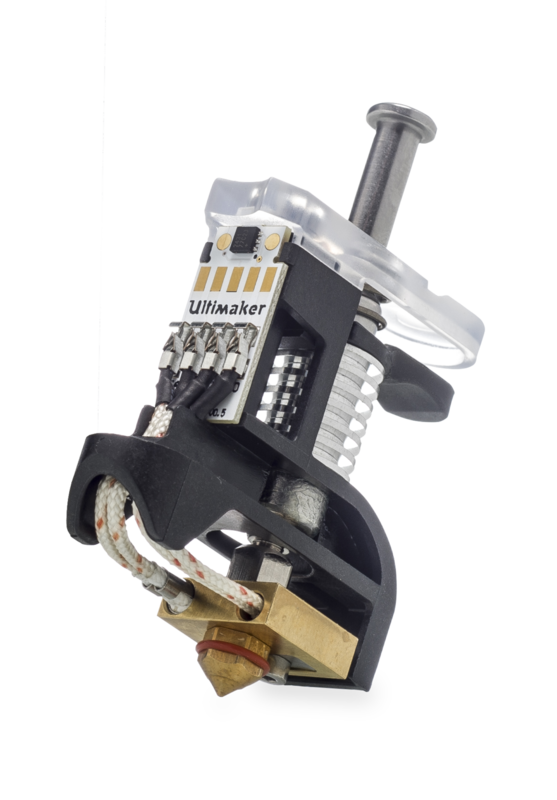 I want to use the Ultimaker 3- 3D printer to Print with Very high temperature materials such as: PEEK, PEKK, ULTEM and their carbon and glass fibre variants with print temperatures between 350 Degrees Celsius and over 400 Degrees Celsius. The problem is the temperature malfunction that occurs just over 350 Degrees C, this is the part I need help with, How Can this Be bypassed? If you choose to do this, I am not responsible for the device jamming from excess paint/incorrect positioning of components during application of C-Coat (TM) given my directions. The entire heating block (Excluding the Nozzle, and the axially adjacent Nut) is Coated with: C-COATTM ceramic thermal-insulation Paint, using a very small paint brush, then leave to dry. raise the bottom of the heat-sink from the plastic holder so the heat-sink no longer makes contact with the plastic holder, either clamp the holder in this position or remove the top holder screw to release the tension in the spring all together, coat the bottom of the heat-sink with the C-Coat paint, then set aside to dry. Now the top screw must be removed in order to release tension on the spring for this step- pull the heatsink assembly all the way back in order to expose the bottom part of the heat sink connector which comes into contact with the plastic holder, now clamp or zip-tie the heatsink assembly in this position and apply a thin layer of C-Coat to the exposed metal surface, leave to dry, then remove to clamp or ziptye and push the coated bottom of the heat sink against the plastic holder face, secure and paint another thin layer on the end of the exposed metal surface, leave to dry, at this paint all of the faces that directly contact the surface of the plastic holder have been coated with the micro insulation paint (C-Coat). To print peek and ultem you really need the bed to get up to 160C. This is the bigger issue for converting. You also need the air temp around 80C which is bad for the steppers so you need to keep the steppers cool somehow (enclose them away from the hot air and add air or water cooling perhaps). The core's themselves probably don't really need any modification. I've heard that the 350C limit is more for the head itself than for the cores. Something in the head gets too hot if you have two cores at 350C I suspect. c-coat may indeed help on this last aspect (keep the heat in the brass block where it belongs). Thank you for your comment gr5, this is only for printing smaller parts for me that is , but for other users who aren't afraid of further modification, C-Coat is further used to insulate the walls (sides back and bottom at 1-1.5mm thickness) to prevent any steppers or other electronics from over-heating, also the bottom of the heat bed should be coated to trap heat so only the top can emit thermal energy into the printed part, this may allow an increase of over 1.8 times the total highest temperature limit if a thick coating is applied. so hot plate (modified) should reach required temp, and air should stay hot without exerting heat on steppers... i aught to try it now. Ultem needs a higher bed temp than that, but PEEK is fine at 140˚C bed temp. Oddly, Ultem doesn't need as high of a nozzle temperature as PEEK. I've printed both below 350˚C, as low as 330˚C, but that was mostly smaller sections, suggesting slower speeds will work until you unlock the temperature limiter. hi, do you know how to bypass the temperature limiter? I don't have a UM3 but I assume that would be in the 8 bit controller board (as opposed to the second board, a 32 bit one, that's also on the UM3), so reflashing it with a higher temperature setting might be possible. It's possible UM3 is more different than I realize though. The temperature limit is in the eeprom on the core itself but I think there may be a second limit at 350C for the head. I've never tried going over 350C. Supposedly the main reason for limiting to 350C is not because UM cores can't handle it but because the head itself can't handle that much heat (obviously the head doesn't reach 350C but it reaches a temperature that is a problem for either the plastic or the electronics - not sure which). Inside the UM3 is a linux computer. You can connect to it through ssh and all the source code for that linux computer is visible python code. If you grep around you should be able to figure it out eventually. I can't help you more than that. There is also a second computer (arduino) on the larger board and that might also have limits but I doubt it. Or if it does then they are probably controlled by some new gcode from the linux computer. So concentrate on the linux computer and let us know what you find. yep, thank you, i will do this. 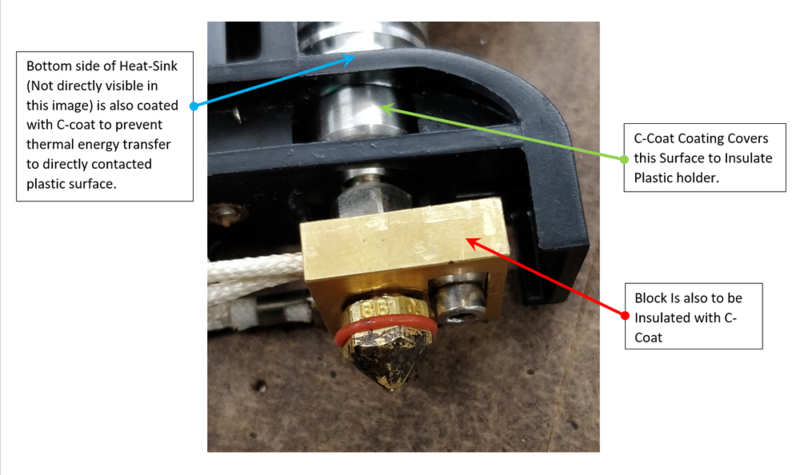 The pre-compiled hex-files are allowing up to 300°C as nozzle temperature. will this work with the Ultimaker 3 (extended)? if it does then it may be the answer.